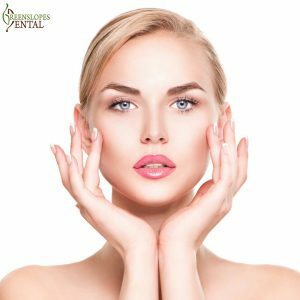 All of these cosmetic filler services are administered professionally and are simple painless and most important of all, effective. We refer to this making over your traditional smile using new cosmetic dental techniques. The results can be amazing as your smile transforms into a much brighter, whiter, stronger and straighter smile. The muscle and tissue in your face is constantly moving with each and every expression and motion made, and mixed with pollution, the sun and general exposure to the elements, our skin tends to wear and show battle scars after time and with age.This process also decreases our natural collagen, hyaluronic acid and elastins needed to give vital support to our skin. As a result, wrinkles, lines and grooves take place and eventually take over. Dento-Facial Aesthetics is therefore used to address the interplay between the mouth and surrounding facial structures, assisting to smooth our wrinkles and fill in the folds. The end result is a much improved smile and beautiful transition which can make you more youthful looking whilst remaining age appropriate, or what we like to call, a true smile makeover. Why Is A Dentist The Ideal Person To Perform This? An experienced dentist such as Dr Audrey Hii, has extensive training, qualifications & expertise all focussed on the face, which makes her among the most qualified to offer you cosmetic injectables and facial enhancement. Knowing exactly where your vital muscles, nerves and blood vessels are in the face are essential to not only achieving the best results, but also avoiding any complications. On top of this, dentists have the important expertise to deliver anesthesia, which are often used daily at clinic such as Greenslopes Dental. This experience will ensure you are kept comfortable at all times and avoid a situation where you may go without anesthetic. On top of this, Dr Audrey Hii can treat previously complicated dental problems, such as Gummy Smiles, Jaw Joint Pain, Teeth Grinding and Facial Pain, with ease, providing additional benefits quickly and easily. So do not hesitate any further, if you are after a complete smile makeover, looking to get rid of wrinkles or create beautiful lips, make sure to book in for a consultation with Dr Audrey Hii today.